Admittedly, I�m not a fashion guy. I�m not ashamed to be seen in my thrift shop specials and I prefer women without make up. So, some might have expected me not to enjoy this film. But, the fact is, this is a very well done production. It opens with a robust energy and enthusiasm and takes complete control of its own pace from then on. This is top notch directing. Top notch. The pace is perfect. The look and sound of the picture flawless (and I saw it at a regular theatre). The acting quite impressive. And the script polished, ready, and confident -- it�s full, and adorned with a great many carefully fun lines. It�s only fault perhaps is tending toward the formulaic -- but how many films don�t. So if you�re high on fashion hi-life or simply shopping at Good Will, I think you�ll have a fun time with this film. Streep of course is solid and Tucci a whole lot of fun. Hathaway plays her part convincingly and all the others are extremely capable. There�s not a poorly delivered line in the film -- by anyone. I especially liked the opening, where the much feared editor (Streep) steps into the office building. People take off like flies. She steams through like a huge ship who�s wake disrupts every ship on the horizon. Nicely done. 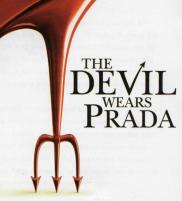 The Devil Wears Prada . Copyright © 2006. Starring Meryl Streep, Anne Hathaway, Stanley Tucci. Screenplay by Aline Brosh McKenna. Based on the book by Lauren Weisbergger. Produced by Wendy Finerman at Fox .